These machine lamps are designed to focus light on any job and flexibility is the key advantage of these lamps. This arrangement reduces eye strain on your employees and increasing their productivity manifolds. These lamps offer complete range of glare free, long lasting and energy efficient products. Designed and manufactured to meet the industry standards, these lamps find wide applications in Textile, Automobile, Engineering Process, Pharmaceuticals, Packaging, Jewellery, Electrical and host of other Industries. For smooth and east movement, the base is made up of aluminium pressure die cast which also gives elegant looks. It is of universal type. easy to install and is fixing directly to vertica or horizontal surface. It is complete with shielded on\off toggle switch and conuuit knock-outs, threaded 3/4"
Hinge joints are of teh friction type provided with ample surface area to ensure complete freedom or 'sag' consistent with a reasonable easy movement for adjustment of position. Nuts used are at superior quality, do not loosen the grip of once tightened, Hence the lamp remains on desired position despite of vibrations while the machine is working. Aluminium stove enamled; designed to provide: 1.Powerful light on specific job or drawing 2.By using 40 watts bulb you get light equivalent to 60 watts bukb light 3.Proper focus of the light only on the job? ������������ Size: 140 mm dia x 133 mm deep Ventilation: The reflector and its canopy are specially designed to provid a ventilation without causing back glare Lamp Holder: Bayonet Cap with H.O. Skirt (Moulded) Wiring: Internal wiring in P.V.C. 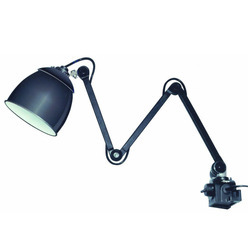 Twin flexible from lamp holder to the base is included in the fitting Models: ML 2 Arms Horziontal Extension upto 23" ML 3 Arms Horziontal Extension upto 33"? ML 4 Arms Horziontal Extension upto 43"? ML 2 Arms Horziontal Extension upto 23"
ML 3 Arms Horziontal Extension upto 33"
ML 4 Arms Horziontal Extension upto 43"